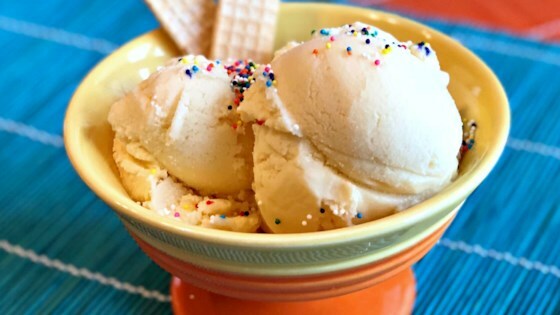 "This is the best Vanilla Ice Cream you'll ever eat. The pudding makes it so much creamier than plain vanilla ice cream. If you want to add fruit, put the sugar in the chopped fresh fruit ahead of time to sweeten it, and then add to the mixture! Please note: this recipe contains raw eggs. We recommend that pregnant women, young children, the elderly and the infirm do not consume raw eggs. Important: be sure to use only fresh eggs for this recipe." In large bowl, beat together eggs, evaporated milk, cream, condensed milk, sugar and vanilla, with electric mixer. Beat in pudding mix until smooth. Pour into freezer canister of ice cream maker and add enough milk to bring mixture to fill line. Freeze according to manufacturer's directions.